Dearest is written entirely in first person from the psycho taxi driver's point of view. The first two chapters of Dearest (a long and trying 56 pages!) is the narrator's somewhat rueful, yet hateful diatribe about the aspects that he feels should make up an "ideal" woman and relationship. Mainly, the narrator's opinions about women in general are so outlandish and crazy that they had me thinking, "Oooooo-KAY!" throughout the entire novel. Additionally, since the novel was published in 1983, the content is VERY dated and the narrator's views could almost be naively chauvinistic. The back cover also features a quote by New York Daily News, which says that Dearest "wins the prize for weird." How completely appropriate, because this book is certainly very weird. 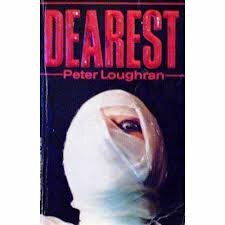 Dearest is written in the style of a madman's diary, and the novel's denouement is not very climactic or shocking. It's actually surprising that the narrator even puts up with Jacqui for as long as he does in this novel, given that her character constantly cheats on him and acts like a total whore with an I.Q. of about 10. Even the ending of Dearest is disappointing, and unexciting. I'm actually still kicking myself for even taking the time to read this entire book from cover to cover. Readers, don't even waste your time with this one. If you enjoy reading horror novels, try reading books by Bentley Little, Bryan Smith, Graham Masterton, Brian Keene, or Gord Rollo. Who are your favorite horror novelists? What are your favorite horror books? Share your thoughts with us in the comments section below! It wins the award for best horror cover.